You play a mercenary 200 years in the future where everything has gone to heck. Oversized, burrowing insects have free reign of the landscape, a mysterious, murderous race of humanoids called The Chosen is on the loose, and everybody is stranded in a small section of Brazil thanks to an amorphous wall of death referred to as The Melding. Enter rocket boots, swarms of enemies and high-powered, exciting abilities. Firefall is an open-world Massively Multiplayer Online Role Playing Game (MMORPG) fused with a shooter which can be played in either third or first person. Similar to other MMOs, you have the ability to choose from several different classes, or in this case, battleframes. The catch? You can buy every kind of battleframe on the same character and switch between them. Say for instance that you’re in a party with two other people, and all three of you are using the same type of battleframe. This will inevitably cause weakness in your group, so you have the ability to go to a Battleframe Station and switch to something more productive, provided you own it. In place of experience levels is an advancement system similar to World of Tanks, the popular MMO / tank combat simulator. Let’s use specifics to demonstrate: Let’s say the first battleframe you use is the Assault, the all-round damage-per-second (DPS) oriented battleframe. As you kill enemies and complete events to gain experience, you spend that experience in large quantities on upgrades in your battleframe’s unique tech tree. A full technology tree consists of dozens of various upgrades that improve your ability to take damage, fire more quickly, hit harder, and learn new abilities specific to your battleframe type. Once you’ve progressed to the end of a tech tree, you can unlock the next tier of battleframe. You start at tier one, of course, and tier two is the highest that’s been integrated into the game, but a quick glance at the menus reveals that Firefall is planned to release with five tiers. As would be expected, each successive tier unlocks new abilities and upgrades. However, once you switch to a battleframe you haven’t used before, your experience is reset ñ all experience gained on any given battleframe is locked to that specific outfit! This prevents players from saving up tons of experience to instantly unlock half of the upgrades on a brand new battleframe that they could not previously afford. Much of the game focuses on interaction with the open world. The main activity, and the activity that earns the quickest experience and currency (for skilled players) is called thumping. Using a Scan Hammer, you scope out a place in the world that contains an underground mineral deposit. You then have the ability to call down a “thumper,” which drills into the ground below. This disturbs the underground-dwelling bugs and initiates a survival event in which you (and ideally, your party) must prevent the thumper from being destroyed by overwhelming waves of insects. Successfully protecting the thumper gives you and your party mineral rewards. Everything else in the world is an open event. Between salvaging crashed hi-tech motorcycles, capturing outposts that have been taken over by the Chosen, and whirlwinds of death and enemies known as melding tornados, there’s a lot to do that attracts sometimes dozens of people to cooperate against a common enemy or work toward a common goal. Even though the entire game is still technically one zone, it feels massive and fresh no matter where you go. 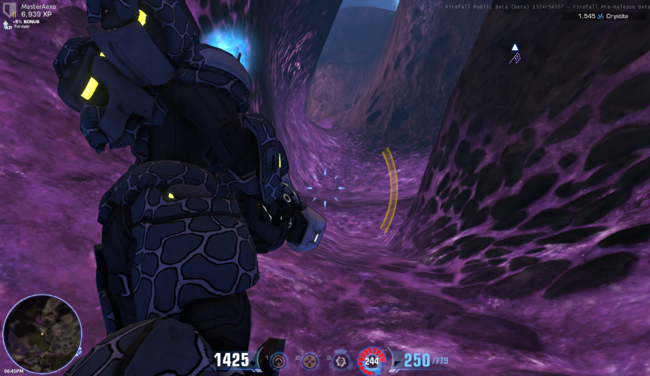 Firefall is still technically a grind, as the development team is currently in their quest creation phase. A rudimentary story quest is in place, and we can clearly expect to see much more before release. 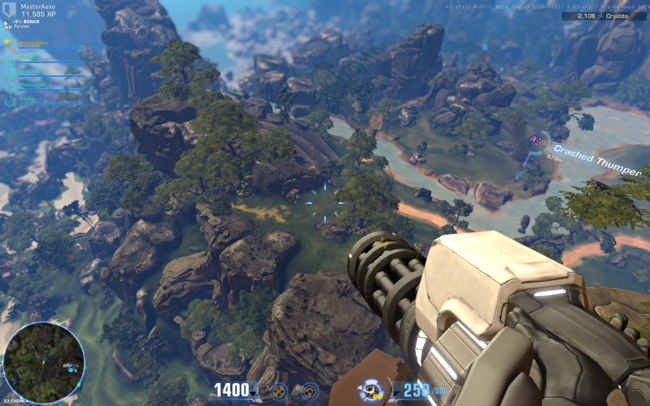 Even as it stands, though, Firefall is fantastic fun and fails to grow boring (unless you insist on playing alone. MMOs are designed to be social games). The best part? Red 5 is releasing it as a free to play game. Go request beta access at firefallthegame.com. It’s an excellent PC MMO that smells of fresh air and drips with the blue, gooey blood of giant bugs.